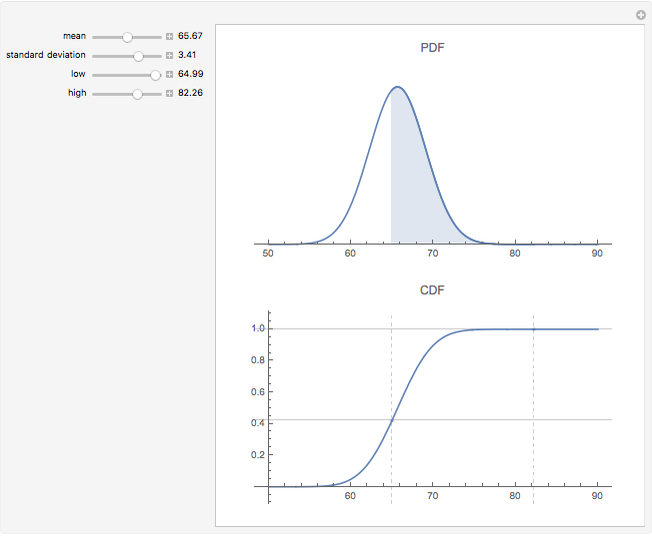 The probability density function (PDF - upper plot) is the derivative of the cumulative density function (CDF - lower plot). This elegant relationship is illustrated here. 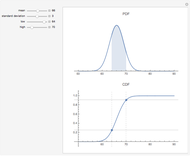 The default plot of the PDF answers the question, "How much of the distribution of a random variable is found in the filled area; that is, how much probability mass is there between observation values equal to or more than 64 and equal to or fewer than 70?" The CDF is more helpful. By reading the axis you can estimate the probability of a particular observation within that range: take the difference between 90.8%, the probability of values below 70, and 25.2%, the probability of values below 63, to get 65.6%. 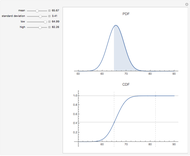 The calculations here are based on the normal distribution, which is completely determined by its mean and standard deviation. Changing these values changes the result of probability estimates. In the first snapshot you can see that the chance of seeing a value at or below 70 is approximately 81%. There is no need to subtract as in the default view because the lower bound of 50 is presumed to have a zero probability. The second snapshot shows that it does not matter which side is filled. 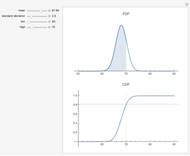 The procedure for finding the probability of particular random variables is the same. In the third snapshot the filled portion of the PDF plot is too narrow to visualize, a reminder that a single point has no probability mass for a continuous distribution. (To avoid problems in the illustration there is a tiny difference between the high and low points—65 versus 64.99—that may be ignored for purposes of the exposition.) 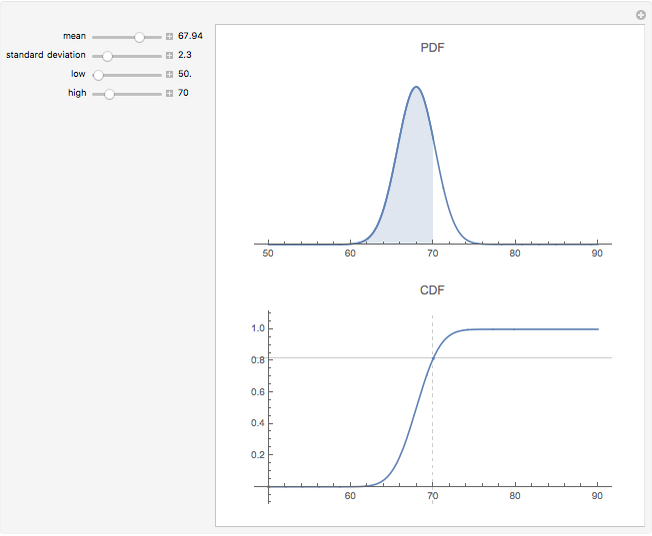 The points in the CDF plot overlap visually, also showing that the probability of being between two values goes to zero as the values approach each other for a continuous distribution. More information is available in Chapter Five of Private Real Estate Investment and at mathestate.com. Roger J. Brown "Connecting the CDF and the PDF"